If you can afford it, we’d wager there are few players who wouldn’t choose a guitar at this level. Build, good weight, big neck profile and sounds, not least the muscular neck pickup. The term Master Design seems to have been used for various models, and even pickups over the years, but it was back in 2014 - the 60th Anniversary of the Stratocaster - that the term was applied to guitars designed by John Cruz (’63 Relic Stratocaster) and Todd Krause (’50s Relic Stratocaster in Moss Green). Todd’s latest Master Design again illustrates his preferences and, like the prior model, also has some electronic tweaks. It’s the neck here that is this guitar’s boldest statement. If you like big, big necks, this quoted ’55 soft V will be love at first feel. In fairness, it’s only very slightly bigger dimensionally than the recently-reviewed ’53 soft V profile of the Tele, but our left-hand is telling us different. Unlike the ’53 Tele, there’s no finish on the back of the neck, either; the maple already looks dirty, and won’t get cleaner, contrasted by the finish around the base and the back of the headstock. If we’re honest, it looks like someone has taken a piece of sandpaper and rubbed off the finish rather than it being worn away from years of use. Whatever, it feels great, especially if you live with your thumb around. As with Todd’s previous Master Design, the Hand-Wound single coils have additional copper foil shielding along with foil and a thin metal control plate on the back of the scratchplate. The cavities are screened with conductive paint, too, but the circuit is deliciously old-school with a three-way pickup selector, single (non- boutique) 0.1microfarad cap and CTS 250k pots, and, as wired, there’s no tone control for the bridge pickup. The fretwire gauge is slighter smaller here, but the setup is just as sharp with quite a lot of tilt to the vibrato, which, using three springs, gives an up-bend of approximately four semitones on the G string and just a shade under a full tone on the high E. The small length screw-in arm feels perfect under your right hand, and although this is an original-style vibrato, the stability fresh out of the case is pretty good. 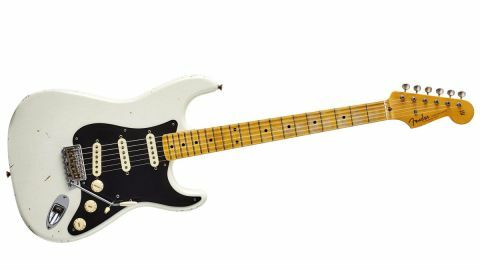 For example, the ’56 Strat’s neck pickup proves just about as muscular as its big- boned neck: it’s thick and woody and when people ask why you’d spend £4k on a Strat, well, have a listen here. There’s no overwound power; it’s more like you’ve upped the size of your speaker cabinet. The three-way switch does mean you have to lodge it to get those classic in-between sounds, which can be a little touch and go, especially live, and the ’56 then almost focuses on the Strat’s trio of primary voices. On one hand, the bridge does sound a little thin, though with a slightly rounded brightness yet quite visceral in its attack. As ever, the middle pickup sits on the fence: lighter than the neck, beefier and less sharp than the bridge. Whatever each of the subtleties of the design brings, the combination is quite something. The neck won’t be for everyone, but that’s the beauty of the Custom Shop proposal: you choose.